Young Entrepreneur Has A Better Idea. Now What? Meredith Perry, 22, is the founder of uBeam, a startup centered around her invention — a wireless recharging system for laptops, smartphones and other devices. She's hiring, meeting with investors and dealing with companies interested in her innovation. But she faces crucial decisions, and the success of her startup is riding on them. Young Entrepreneur Has A Better Idea. Now What? 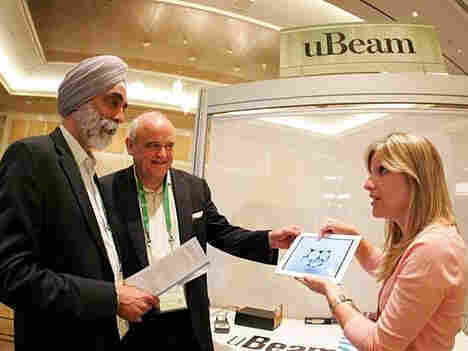 There's plenty of bad economic news these days, but Perry and her company, called UBeam, are trying to defy it — she's hiring and entertaining funding offers from investors. Perry's invention: a transmitter that can recharge wireless devices using ultrasonic waves. It's like Wi-Fi, she says, except instead of a wireless Internet connection, her's transmits power over the air. "What happens is, the ultrasound, which vibrates the air, vibrates what's called a piezoelectric transducer," she says. "And what happens is the ultrasound will vibrate the piezocrystals, and the crystals will move back and forth, and that will generate an electrical current." Perry says the idea came to her when she went to class with a dead laptop and no power cord. She wondered: Why can't I recharge without a cord? "It's 2011, and if we have quote-unquote wireless devices, they should actually be wireless," she says. It's one of those ideas that seems too elegant and simple to be true. Perry is used to fielding skeptical questions. No, the waves don't cause cancer. Yes, she has filed for patents. And yes, it has been tried before — but not using ultrasound. Perry's story is unusual — she's 22 years old and a woman starting a high-tech company. But she downplays her youth and gender. Perry seems to have always gone through life on fast forward. She was just in Houston running a zero-gravity experiment for NASA, where she was a student ambassador. She flew in a plane that went up and then down at very high velocity. "It's called the 'vomit comet' for a reason," she says. Things at UBeam also happened swiftly. This past April, she won an invention competition at the University of Pennsylvania. Her idea caught the eye of Walt Mossberg, a technology columnist for the Wall Street Journal. He asked her to present at All Things Digital, a conference he runs that is like Mecca for the tech industry. Perry pursues her interests with an intense, nerdlike focus. Arthur Perry, her father and early source of funding for UBeam, says as a child, Meredith wanted to invent things, like an umbrella you could use while biking. He recalls her at age 8 reading a book by Louis Sachar. "She loved it so much, she somehow found out his phone number, called him up and actually spoke to him on the phone," he says. "At age 8, you know — that's Meredith. Not enough to read the book — she had to speak to the guy who wrote it." Perry has no background in electrical engineering. She is self-taught by reading online, mostly Wikipedia. In the business world, she's like a guppy navigating a shark tank. Fortune 500 companies already called to issue veiled threats, telling Perry she ought to license her technology to them. "And they also know that you have zero money, and they have tons of money, so you'd lose in a lawsuit," she says. Perry often turns to a team of mentors from school and at other companies. They say she's a quick study and good at listening to advice. Still, it's hard having UBeam's success or failure resting on her young shoulders. "I literally feel like I'm bipolar, like, every single day, because I'll go from an extreme high thinking this is going to be a billion-dollar company to thinking this is totally going to fail a half an hour later," she says. One huge decision weighing on Perry right now is where to take funding. She has an offer from a private equity firm but is meeting with other potential investors. She's also trying to hire three engineers and an experienced business partner. "There are about 8 billion decisions that you need to make daily. Like, I'm the janitor and I'm the CEO," she says. "Everything you can possibly think of from what logo should I chose to who should I hire, to should I take money from this person to what lawyer should I get." Perry says she's determined to make UBeam succeed. But she also has four other business ideas she'd like to get to.